A snapshot of today’s accommodation options in Hainan. Touted as the country’s only "international tourism destination," Hainan is at the forefront of China’s hotel boom. 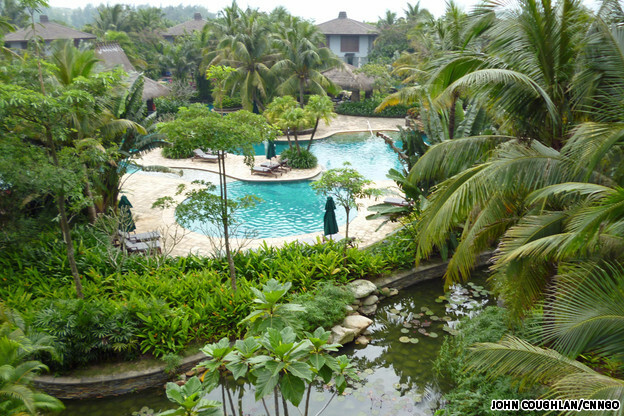 According to the Hainan Tourist Bureau, the 33,000-square-kilometer island houses more than 209 starred hotels. At Haitang Bay alone, a 42.8-kilometer beach on the eastern coast, around 30 five-star resorts and 70 luxury hotels are planned to open over the next few years. 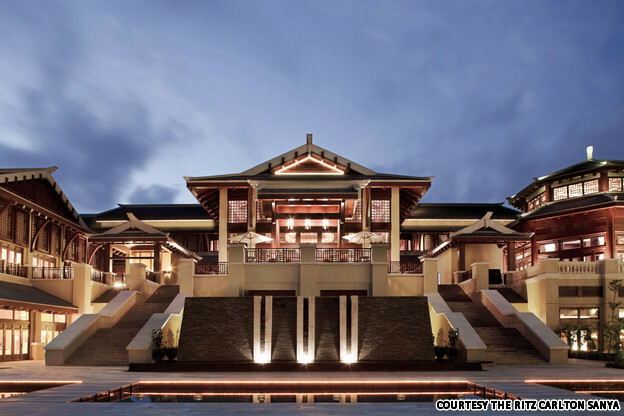 When guidebook author Andrew Dembina first visited Hainan in 1992, the closest beach to Sanya had a handful of hotels and Yalong Bay had just one resort set back from the long beach. Now, both beaches are jammed with resorts. "The Sheraton at the man-made Holiday Beach, just outside Hainan’s capital of Haikou further north, is the only foreign hotel brand to have survived a few years in this lesser visited vicinity," notes Dembina, who wrote the Hainan chapter for Insight Guides’ "Southern China" guidebook. Here’s a snapshot of today’s accommodation options for visitors exploring China’s answer to Hawaii. 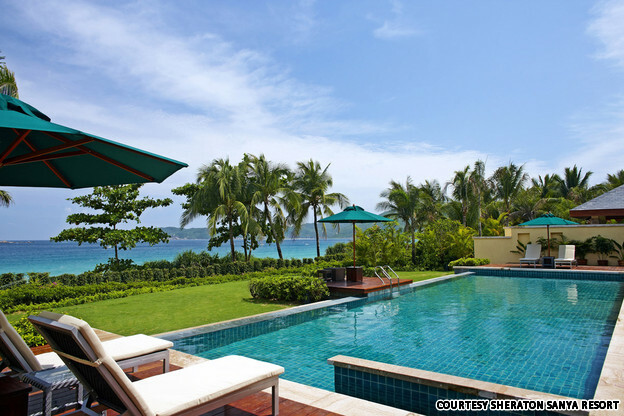 The private pool in Sheraton’s Presidential Villa provides the X-factor in "exclusive." One of the first developments on Yalong Bay, the 7.5-kilometer beach with almost 20 five-star lodgings ranged side-by-side, the Sheraton is apparently the hotel of choice for Chinese Premier Wen Jiaobao. Far from trendy — music by 1990s-era U.S. rock band Hootie & the Blowfish greets guests in the lobby — the 511-room compound does boast the largest conference rooms in Sanya (the biggest covers 1,250 square meters) and offers the best chance of bumping into the leader of an emerging-market country. Yalong Bay Golf Club right across the street may be the best course on the island. A majestic accommodation that would make the Qing Emperor jealous. A 20-minute walk (or a five-minute Segway) along the beach from the Sheraton, the 450-room Ritz-Carlton was designed as a tropical homage to Beijing’s Summer Palace. Perfectly manicured gardens and an endless river-style pool greet visitors along with a choice of several different types of English sea salt at the beachside bar and grill, indicating the Ritz-Carlton’s legendary attention to detail. The dedicated Kids’ Concierge is probably what appeals most to families, with activities like chocolate-making sure to impress (and raise blood sugar levels). 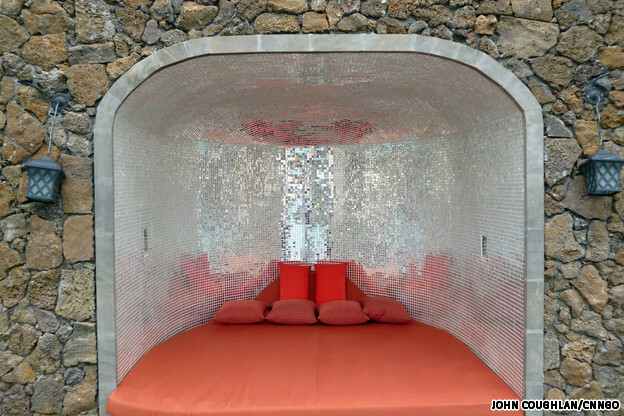 Achieve your maximum bling by partying at MGM’s poolside bed chamber. Just next door to the Sheraton, the vibe couldn’t be more different. Eschewing the generic-Bali style design favored by most Yalong Bay resorts, MGM Grand brings a more modern look. The 597-room hotel is set apart by its lipstick tube tower exterior and space-age interiors with MGM’s traditional lion motif throughout. The painting of a lion’s head hung in the lobby is the work of famed Belgian-American speed painter Jean Francois. But the main draw at the MGM Grand is Wet Republic, a “day club” with poolside DJs and model waitresses from 11 a.m.-6 p.m.
One of the 240 rooms in Pearl River Garden where you can practice your karaoke pose before hitting the beach. The Dadonghai side of Hainan has received justifiable acclaim for cornering the “Speedo-clad heavyset Russian” market, and the Pearl River Garden Hotel is perhaps the best place to observe this firsthand. According to the hotel staff, Russian tourists account for 80 percent of the four-star establishment’s international clientele because "Russians love basking in the sun, and Sanya is a popular getaway for them around the year." Non-stop beachside karaoke and a drained swimming pool — temporarily pumped for maintenance when we visited — just add to the resort’s charm. 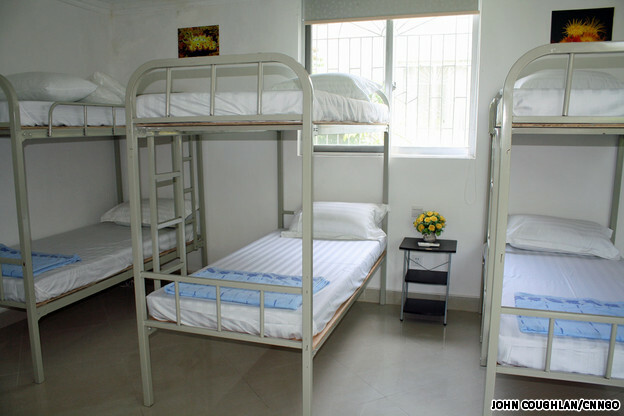 Sanya Backpackers provides no-frills bunks but a variety of tropical activities. Singaporean Chris Chiang and his wife Linda Qin, from Shaanxi, run the cleanest hostel in town. It’s an open secret among foodie travelers that the best food in Hainan is not found in five-star hotels, but among the island’s myriad street food stalls, and the eight-room accommodation is a five-minute stroll from one of Sanya’s best food streets, Haihua Lu. Guests can relax on the chilled-out roof deck, and the friendly couple also operates a slate of activities, including scuba diving in season as well as surf outings and rain forest tours. 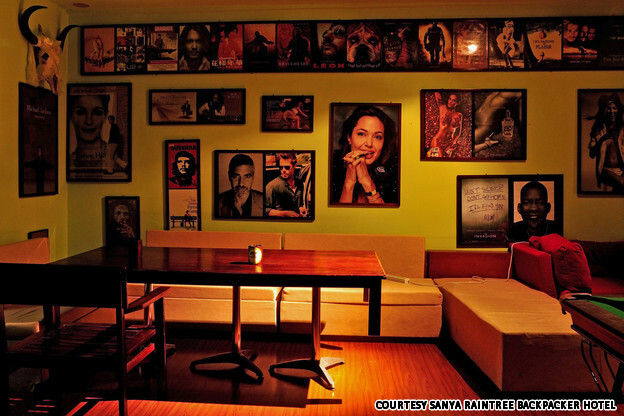 Raintree’s walls are reserved for graffiti and movie posters. Tian Le, aka Justin Tiller, is the coolest guy in Hainan and his hostel, Sanya Raintree, reflects this. The born-and-bred Inner Mongolian picked a foreign surname as his business pseudonym because it’s easier for international travelers to remember. In addition, Tiller sounds similar to his real surname, Tian. With a central location, hip art on the walls and a well-stocked bar for international cocktails, Raintree is a great jumping-off point for any trip to Sanya and is the preferred launch pad for many surfers at the annual Surfing Hainan Open. Justin and his friendly staff are happy to arrange surf trips, bike tours or a night on the town. Take a dip at Le Méridien’s jungly pool before the tourist troops arrive. About a 90-minute drive from Sanya is Shimei Bay, one of Hainan’s best surf spots (neighboring Riyuewan hosts international surf competitions). The Le Méridien organizes activities ranging from mountain biking (free rentals), jetskiing, and scuba diving on nearby Jiajin Island, as well as a full-size infinity lap pool and private villas with very private swimming pools. Although the resort is currently blissfully isolated from the hustle and bustle of Sanya, construction in Shimei Bay continues apace, with fellow Starwood hotel The Westin due to open next door and a separate luxury apartment complex under development. 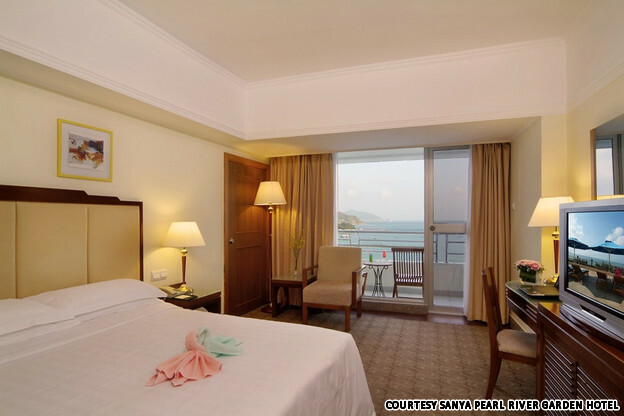 Ask for a beach-facing room to maintain peace and tranquility and enjoy the best getaway Hainan currently has to offer.